It's a massive patch, six months in the making. Fists of Heaven has the scoop (and that lovely screenshot above) about an upcoming Homeworld Remastered patch, six months in the making. By the sounds of it, it's a pretty huge patch that overhauls ship formations and behaviour, implements a proper ballistics system, and that adds new features to Remastered's modding tools. You should read the whole article to get the full picture, but I'll add a couple of choice quotes below. 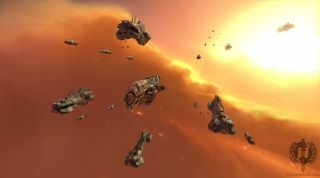 "Rather than simply fixing the formations that we’re familiar with from the original games, the Homeworld team have taken things several steps further. First, ships are all being treated by the game engine as one unit, so, for instance, Hiigaran strike craft won’t always be locked into the squadrons they’re produced in and instead and can enter larger formations with the same class of ship (but will reform into their original squadrons if removed from the formation)." "Targeting behavior has been completely reworked, and ships now prioritize targets much more intelligently than before. Stationary ships will be more appealing targets, and ships that dramatically affect the battle (such as gravwell generators) will become high priority targets when activated, causing ships in the vicinity to break off of previous targets to face the new threat." Developed with the help of Remastered's modding community, the new patch is the result of six months of full-time work by a group of developers at Gearbox. We can expect graphical updates, balance changes, and bug fixes in addition to the aforementioned stuff.